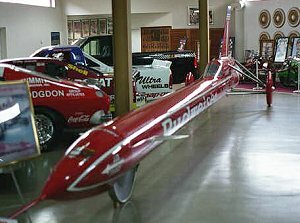 Sponsored by Budweiser the Budeweiser rocket car was built in 1979 with the intention of being the first land vehicle to break the sound barrier in the “Project Speed of Sound”. 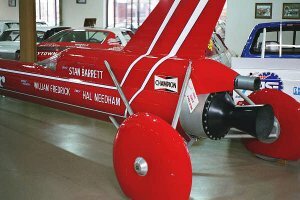 On the 17th December 1979 the vehicle, driven by Stan Barrett, attempted to break the sound barrier and has left a legacy that has been controversial ever since as the final speed of the vehicle has always been disputed. It was believed that the car could exceed the speed of sound but when the vehicle was run no sonic boom was heard. The speed was estimated from a radar system at 38 miles per hour - though unfortunately this had been tracking a large truck in the distance, away from the track that the rocket car had used. Some hours after the run the speed (at the vehicle’s peak) was calculated at 739.666 miles per hour, ( Mach 1.01 ). This however caused wide scepticism and the speed was never officially recorded. The speed was calculated by the US Air Force using a new ground based tracking radar. The speed did peak above the calculated sonic speed based atmospheric conditions. The Air Force is not a certifying organisation and so would not say the vehicle went sonic and they waited 7 months before they would release a speed calculation. The record would not stand anyway because the vehicle did not maintain the sonic speed for more than a moment or two and there was no second run or even attempt because of the requirement and time to remove and replace the Sidewinder air to air missile that provided the motive force. The second version built but only used as a show car was given to the Richard Childress Racing organisation in North Carolina, USA. The 1979 Budweiser rocket car. (My thanks to Dave Major for sending in these photos. ).